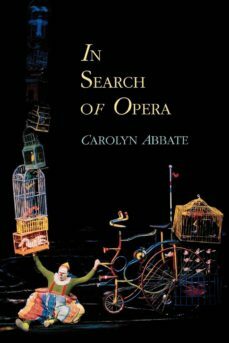 In her new book, Carolyn Abbate considers the nature of operatic performance and the acoustic images of performance present in operas from Monteverdi to Ravel. Paying tribute to musics realization by musicians and singers, she argues that operatic works are indelibly bound to the contingency of live singing, playing, and staging. She seeks a middle ground between operas as abstractions and performance as the phenomenon that brings opera into being.Weaving between operas "facts of life" and a series of works including The Magic Flute, Parsifal, and Pelléas, Abbate explores a spectrum of attitudes towards musical performance, which range from euphoric visions of singers as creators to uncanny images of musicians as lifeless objects that have been resuscitated by scripts. In doing so, she touches upon several critical issues: the Wagner problem; coloratura, virtuosity, and their critics; the implications of disembodied voice in opera and film; mechanical music; the mortality of musical sound; and operas predilection for scenes positing mysterious unheard music. An intersection between transcendence and intense physical grounding, she asserts, is a quintessential element of the genre, one source of the rapture that operas and their singers can engender in listeners.In Search of Opera mediates between an experience of opera that can be passionate and intuitive, and an intellectual engagement with opera as a complicated aesthetic phenomenon. Marrying philosophical speculation to historical detail, Abbate contemplates a central dilemma: the ineffability of music and the diverse means by which a fugitive art is best expressed in words. All serious devotees of opera will want to read this imaginative book by s music-critical virtuoso.